I love fruit and green smoothies as much as the next person, but superfood smoothies are by far my favorite. 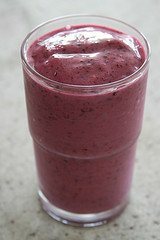 A smoothie for breakfast full of real superfoods never fails to put me a good mood, with plenty of energy, and a positive, up-beat attitude for the entire day. 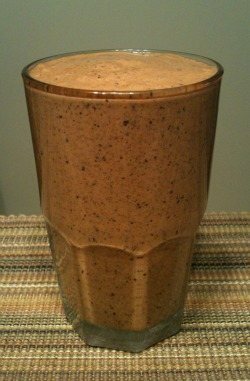 This smoothie features three of my all-time favorite superfoods, goji berries, cacao (raw chocolate), and maca. 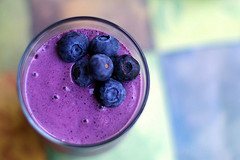 Almond/Coconut milk, frozen blueberries, banana, Sun Warrior chocolate protein, and a dash of sea salt round out this nutrient dense recipe. So, what’s so special about each of these superfoods? Brain health is vitally important in this fast-paced world we live in where things are coming at us from every direction. 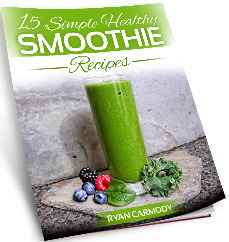 The ingredients in this smoothie recipe all play a role in improving your mental clarity, memory, and overall brain function. Here’s a run down of each ingredient and its respective brain boosting benefits. The base of this smoothie is apple juice, which prevents the loss of the neurotransmitter acetylcholine, critical for memory and brain health. How often do you read or hear someone talking about antioxidants? They’re all the rage. 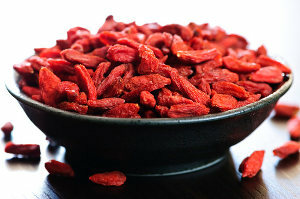 Foods and supplements high in antioxidants are held in high esteem, and for good reason. Antioxidants are substances that protect your cells from damage caused by unstable molecules, better known as free radicals. Free radicals are produced through the process of oxidation, which is the interaction between oxygen and other molecules. A rusty car bumper is an example of damage from oxidation. Your body produces free radicals when your cells use oxygen, as is the case when breaking down food and exercising. Exposure to environmental toxins like smoke and radiation also produce free radicals. Free radicals are implicated in a number of diseases including cancer and heart disease.